I am assuming the rhythms of life here at the Mesa Refuge, an artist’s residency located on the bluff of Tomales Bay in Point Reyes. I have a two-week stay, 14 whole days to slow down and sink deep into my writing. I am hugely grateful for the opportunity; it’s a gift bigger than my restless and undisciplined spirit deserves. The house is high ceilinged and beautiful, the walls paneled in windows that reveal the expanse of bay and surrounding marshlands. The well-tended gardens that surround the perimeter release a scent of jasmine that breezes through the open doors and windows. Except for the calls of egrets and marsh hawks, there is almost total silence here. 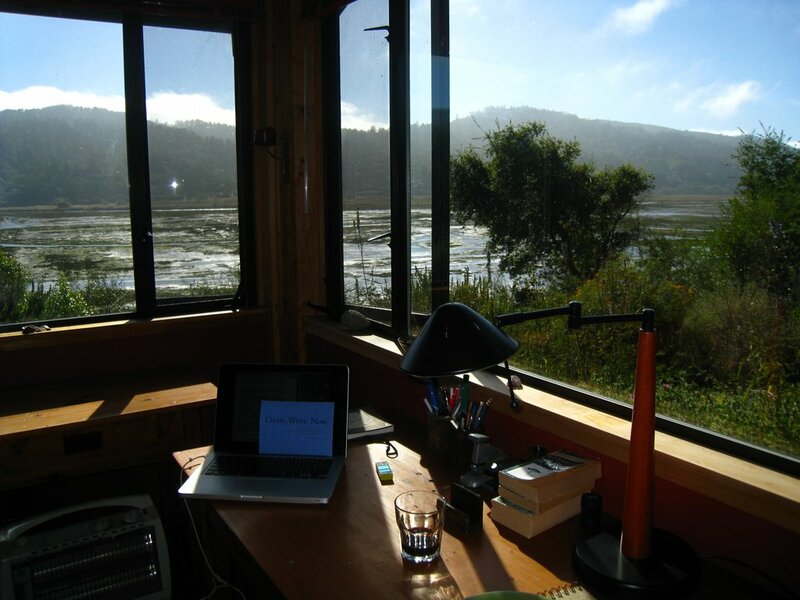 In my writer’s shed out back, I can formulate my thoughts while watching the wetland colors transform blue-green-red-brown in the shifting sun. This morning was perfect writing weather and a heron flew over the marsh against the gray drape of sky. When he landed in the shallows, his blue body went dead still, and he stared at the water surface for what seemed like an hour. This vision of immense patience affirmed a truth about writing that I have more and more been sensing: that the trick to doing it well is not really a matter of logistics–plotting out action or deciding on tense. That the trick to good writing learning how to sit heron-still and to be quick on the strike when ideas come. I believe that the best writers are not those with the most talent, or the largest vocabulary, but the ones who can sit still the longest. There is nothing to stop me from sitting still here. No noise, no interruptions, no social events. Even the most mundane tasks are covered; dinner is catered each night and a bag of coffee and a French press sit poised on the counter each morning. If I’m in need of a contemplative walk, there are 70,000 protected acres of surrounding land. If I am wanting for inspiration, there is a library full of books—many of which were written in this very house—Michael Pollan’s Omnivores Dilemma, Terry Tempest William’s Leap, Jeff Greenwald’s Size of the World. If I get nothing done here, there is no one and nothing to blame. All my needs are met. It’s a bit bewildering. I’m used to being knocked around and ignored by overwhelmed editors, to being underpaid and undervalued. Here, at the Mesa Refuge, it’s like time traveling back to the patronage system of the Renaissance. I am treated as if my work Matters– so much that there is a fresh rose placed near my bed, and an apology offered that the footpath leading to the overlook isn’t better swept. The only obstacle left now is you, observed my mentor. His statement is both true and terrifying. But lest I forget why I am here there is a desk in every room to remind me, and a dozen pens on every desk. This is my commitment to myself: everyday for the next 14 days, I will sit my restless spirit down and focus. I will follow the lead of all the writers who have stayed here before—known and unknown—and assume their steady breath. I will enter the lineage of herons who hold so still out there on the marsh, patient, unmoving, waiting for a catch. Thank you Peter Barnes for the gift of the Mesa Refuge.